Just back from the Wisdom 2.0 Conference in San Francisco where I spent Friday and Saturday learning from a group of leaders in mindfulness and meditation. I had the opportunity to mediate with Jon Kabat-Zinn and Trudy Goodman. Amazing! I heard Goldie Hawn speak about Mindup, an organization she founded to teach kids about their brains, mindfulness, and the importance social emotional learning. My favorite talk was by Tristan Harris of Humane Technology who shared his thoughts about taking back our lives and attention from our screens. 1- Turn off all notifications. Notifications appear in red because red is a trigger color that instantly draws our attention. But most notifications are generated by machines, not actual people. 2- Go Grayscale. Colorful icons give our brains shiny rewards every time we unlock. 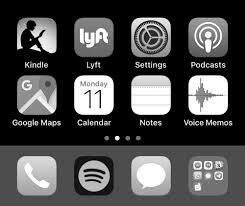 Set your phone to grayscale to remove those positive reinforcements. This helps many people check their phones less often. 3- Keep your device outside of the bedroom. Get a separate alarm clock for your bedroom, and charge your phone in another room (or at least on the other side of the room). More tips I learned. And check out this Ted Talk by Tristan Harris. Instead of the 20 minutes you would waste on your phone today, call a friend, walk your dog, or spend time in nature.